SNP Deputy Shadow Justice Minister, Stewart Stevenson MSP, today (Thursday) called for the Executive to make a New Year’s resolution to adopt a more consensual and unified approach to tackling Scotland’s drugs problem. “The fact that Scotland has 51,000 intravenous drug users clearly underlines the fact that we must raise our game so as many people as possible are given the opportunity to kick the habit. “This can only be done if we draw together all the strands of the fight against drugs into one unified approach. We must pay heed to what drug addicts are telling us- that they want to beat their addiction and forge a life without drugs. “No more than one in 20 drugs users wants to stabilise their condition through the likes of methadone. This means we must make greater commitment to programmes that will wean addicts away from their addiction and promote long-term abstinence. “We must also promote inter-agency work and information sharing to ensure a more effective and unified approaching to tackling this problem. “The Scottish Drug Enforcement Agency recently called for greater resources, and we must ensure this call is answered. We must also hit the drug barons where it hurts - in the pocket. “We can now see why the Trots have been so reluctant to publish their accounts. Chartered Accountants Sinclair Wood & Co, who were employed to audit the SSP accounts, are commenting that 'we have not obtained all the information and explanations that we considered necessary'. Stewart Stevenson: ... ... ... It would be useful at this stage if he were to make clear that the issue at the core of his argument is that we should be accountable for how public money is spent on each and every occasion when it is provided. Tommy Sheridan: We should be absolutely accountable at every moment for how public money is spent. Banff & Buchan MSP Stewart Stevenson has backed Aberdeen North MSP Brian Adam’s Parliamentary Motion regarding concern surrounding Shell’s announcement in response to Chancellor Gordon Brown’s tax hike. “It is of great concern to hear Shell’s recent announcement that it is to cut its plans for North Sea exploration and, quite rightly, Shell is laying the blame at the Chancellor of the Exchequer’s door. This poor decision by the Chancellor has certainly knocked the industry for six. “Of course, this monumental decision will have a serious detrimental knock-on effect throughout the entire North Sea supply chain. Be of no doubt that this is most certainly going to end in the loss of jobs and shall also, as a result, threaten future investment. Banff & Buchan MSP Stewart Stevenson has added his support to his SNP colleague, Rob Gibson’s Parliamentary Motion supporting local food. “I agree wholeheartedly with Rick Stein’s Christmas message that to source the best food, families should buy local produce. The North-east is home to some of the best producers of food who utilise locally sourced ingredients. “Local produce has a reputation for high quality and excellent taste. More and more people are turning their backs on the bland, mass-produced fare doled out by the multi-nationals and are beginning to appreciate that the local butcher, baker or fishmonger offer great value as well as great taste. Local MP Alex Salmond has welcomed the inclusion of various Banff & Buchan attractions in the publication of the ‘2006 Aberdeen & Grampian Highlands Holiday Guide’ by the local tourist board. “There are numerous attractions throughout Banff & Buchan that reflect the diverse nature of the area. The inclusion of highlights such as Slains Castle, the New Pitsligo Visual Arts Exhibition and Macduff’s World’s Ocean Day to the Holiday Guide will help raise the profile of Banff & Buchan and improve the local economy. “Linked to this of course is the excellent work done by Peterhead Bay Authority in attracting numerous cruise ships to Peterhead as a stopping-off point and the PBA deserves our thanks for their initiative in this regard. Banff & Buchan MSP Stewart Stevenson has added his name to his colleague Shona Robison’s Parliamentary Motion on the recent Macmillan Cancer Relief report. “The recent Macmillan Cancer Relief report, ‘Free at the Point of Delivery?’ highlights the financial burden that travelling to and from hospital for regular treatment places on cancer patients. It is frightful that there is no record of the percentage of cancer patients in Scotland who are currently eligible for reimbursement of their travel costs under the Hospital Travel Costs Scheme. It is therefore probably so that there are many cancer patients on low incomes without much-needed financial support. “I generally welcome these figures as the fight on drugs should not be seen as a partisan issue. However, this is just one piece of the information jigsaw on drugs and the Executive is still operating in a knowledge vacuum when it comes to Scotland’s drug scene. “There is a ‘golden moment’ when addicts want to give up their habit and we must do everything we can to help addicts seize this opportunity. The Executive, however, does not know what the ratio is of people wishing to enter a methadone maintenance treatment programme to places available. At 10.00am, Mr Stevenson will draw the Christmas Raffle for ‘Crossroads Caring for Carers’ at 12 Frithside Street, Fraserburgh. Crossroads manager Elizabeth Eyre and staff will be in attendance. At 11.00am, Mr Stevenson will visit Barnardos, 64 Queen Street, Peterhead to meet with staff and hear more about their Aberdeenshire youth projects. Banff & Buchan MSP Stewart Stevenson has welcomed the decision by the Scottish National Party to commit to an independent commissioner in place of the current voluntary, and largely ineffective, code of conduct for supermarkets. Mr Stevenson proposed the motion at the Scottish National Party’s National Council on Saturday in Perth. “Our farmers have some of the highest quality standards and animal health welfare standards which they must comply with. Often, this has meant significant expenditure for them to comply with EU regulations. It is simply not acceptable that having spent thousands to produce a quality product to the highest welfare standards that the major supermarkets make a dive for cheap imports produced to lower standards when it looks like the price of home-produced beef is going to rise. “The supermarket chains have failed to show that they can act responsibly and live up to their claims that they support Scottish farmers. They have had their chance under the current, voluntary system. Now is the time to act to protect Scottish farmers and producers from the excesses of the multi-national corporations. National Council views with great concern the irresponsible actions of the major supermarket chains regarding cheap beef imports; notes that Scotch Beef is produced to far higher welfare standards than imported beef; applauds the stance taken by Scottish farmers in taking direct action at the doors of the supermarkets to promote their quality product; believes that the major supermarket chains are not driven by the interests of either producer or consumer and considers it time for urgent action to address the situation. 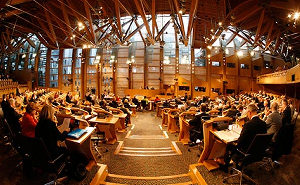 National Council therefore commits the Scottish National Party to a policy of introduction of an independent commissioner to replace the ineffective ‘Supermarket Code of Conduct’ and assume the role of the Office of Fair Trading (OFT) in ensuring that farmers and producers get a fair deal for a quality product. Stewart Stevenson MSP will visit Royal Mail’s Banff Delivery Office on Monday 5 December at 7.00am to see the festive operation in full swing on what is anticipated will be one of Royal Mail’s busiest days. Stewart Stevenson will be welcomed at Banff Delivery Office by manager Ian Jackson and all the postmen and women who are working hard doing their bit to sort and deliver Banff’s share of the estimated Scottish Christmas postbag of 250 million items. Stewart Stevenson MSP said: "I’m looking forward to visiting the Banff Delivery Office once again to meet the staff there and see the scale of the operation. I have visited all the Royal Mail Delivery Offices in Banff & Buchan since I was elected in 2001 and this has turned into something of an annual engagement for me. Royal Mail is expecting to deliver over 18.5 million letters and cards in the AB postcode area throughout this Christmas. The operation will involve more than 1,350 postal staff, backed by 140 seasonal workers, plus an extra 73 vehicles on top of the 332 strong transport fleet. On top of vehicles the area also uses 207 bicycles. There are 1010 postboxes to post Christmas cards. "This is a terrific vote of confidence in John Watt and his team at Macduff. £4 million of new business is a very welcome boost to the local economy in a town where that is much needed. "What we now need is the comparatively modest funding that will upgrade the slip and quay facilities so that this order is merely the first of many future sucesses." It is understood that the 80ft fishery research vessel which is being ordered by the Scottish Executive will carry 14 crew members and scientists.